Claiming to have cracked the July 11 train blasts case, the Mumbai police lays the blame on Pakistan's ISI and several other organisations like the Students Islamic Organisation of India and Lashkar-e-Toiba. 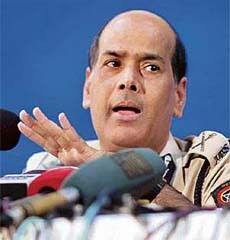 Should the policemen who helped in transporting arms used for Mumbai blasts be given deterrent punishment? What should be done to stop tainted politicians from fighting elections? Pakistan today said India shouldn’t point finger at it without evidence. The reaction comes after Mumbai police blamed Pakistani spies and militants for a series of blasts that killed 186 persons in Mumbai on July 11. 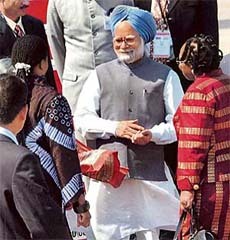 It was just a 15-minute journey from Pentrich to Pietermaritzburg for the Prime Minister, Dr Manmohan Singh, but the significance of it weighed so heavily on him that he found “it is easy to feel the presence of the Mahatma here and to imagine what he went through during that night of June 7,1893”. The US Senate today formally went into recess prior to the November 7 Congressional polls without taking up a Bill on enabling Indo-US civilian nuclear cooperation as the ruling and opposition lawmakers failed to reach a consensus on how to deal with the legislation. Newly appointed rural pharmacists faced the wrath of the men in khaki as they started raising slogans when Punjab Finance and Health Minister Surinder Singla completed his address at a health camp organised at Goniana Mandi, near here, today. 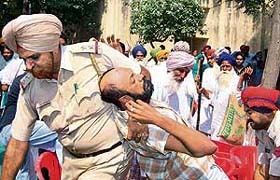 Policemen take away protesting pharmacists from the venue of a medical camp organised at Goniana Mandi on Saturday. Mr Shiv Shankar Menon will take over as new Foreign Secretary tomorrow. Mr Menon succeeds Mr Shyam Saran who has been appointed as Special Envoy for negotiations relating to the Indo-US deal after his retirement. Elderly parents will soon have provision for a fast-track and cost-free legal remedy against neglect by their children. For this, they will just have to complain to tribunals, to be set up soon to consider and dispose of their claims for maintenance in a time-bound manner. Terrorism is not a Pakistani phenomenon but an import to the country... The whole world is to be blamed, it (terrorism) is an import to the country.